Our range of products include steel junction box. In order to meet with the diverse requirements of clients, we are engaged in manufacturing and supplying Steel Junction Box. Our junction box is available from us on number of specifications as per the demand of customers. Apart from this, the offered product is rigorously tested on numerous parameters of quality. 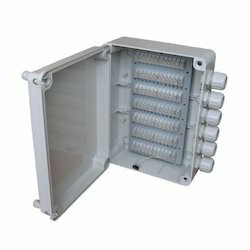 These Steel Junction Box are manufactured with utmost precision by utilizing best grade material and advanced techniques in adherence with the set norms. All junctions boxes are provided with brass insert and covers. These box are fitted in both commercial as well as residential swimming pools.